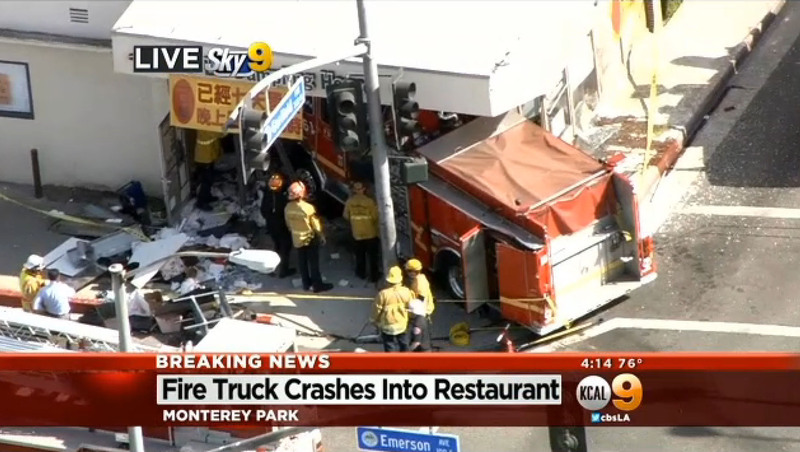 Fire truck crashes into Chinese restaurant outside L.A.
MONTEREY PARK, Calif. -- A fire truck crashed into a Chinese restaurant in Monterey Park on Wednesday afternoon, injuring at least 14 people, CBS Los Angeles reported. The incident occurred at the corner of Emerson and Garfield avenues. Two fire engines, one from Monterey Park and one from nearby Alhambra, collided at the intersection, sending the Monterey fire engine crashing into Lu Dumpling House. Monterey Park Fire Chief Jim Birrell told CBS Los Angeles that three to four firefighters suffered minor to moderate injuries. "I've got a total now of 14 patients. At this time we have one critical and we have three to four minor to moderate (injuries)," Birrell said. There is one confirmed injury of a person in the restaurant. A fire department official said the trucks were both responding to a same house fire on East Graves Avenue when they collided. The Monterey Park Fire Department was treating the injured and transporting victims to hospitals. Monterey Park is located 10 miles east of downtown Los Angeles.